One pot cooking no longer belongs to campers and bachelors. One pot meals can be both creative and nutritious and as always time saving. These meals require minimum clean up and are served directly from the pot to the table. By trying different variations on the same concept the possibilities are endless; however the procedure is pretty much the same. There are three main themes to one pot meals: rice, potatoes, and pasta. The key to making these meals original is substitutions. You can vary the ingredients to suit even the pickiest eaters. The following three methods are taken from eartheasy.com. 1. Put 3 cups cold water and a pinch of salt in a 2qt saucepan. Bring to a boil. Add 1 1/2 cups brown rice, let water return to a boil, then lower heat to lowest setting and cover. Leave lid on and cook for 30 minutes. 3. Add grated cheese with thinly sliced almonds. Sprinkle bread crumbs as an option. Cover and remove from heat. Let stand 5 minutes and serve. For substitutions, you can use white, brown or basmati rice. A bouillon cube, chicken or beef flavor, can be added to the water if you plan to use strips of chicken or beef with the dish. Any quick-cooking fresh vegetable can be used. Avoid using frozen vegetables. Slower-cooking vegetables like carrots should be thinly sliced. Grated cheese topping can be replaced with tomato or mushroom sauce. If you're cooking for more people, use a larger saucepan. The pan needs to be large enough so that the rice, when cooked, occupies no more than 2/3 the volume of the pan. 1. Put 2 inches of water and a pinch of salt into a 2qt saucepan, and set a steamer basket or pan on top. Peel 3 or 4 large potatoes, cube into fairly large pieces and place in steamer. The potatoes should only fill the pan halfway, or a little more. Cover and cook on med-hi for 12 minutes. 2. Add large pieces of fresh broccoli, zucchini or cauliflower, and thinner slices of carrot and onion. Add seasonings such as thyme, rosemary and garlic powder. Set thin strips of ham, cooked chicken or tofu on top of the vegetables. Cover and cook for 10 minutes. 3. Test for doneness by piercing a potato with a fork - the fork should slip out without lifting the potato. Add topping of grated cheese, mushroom sauce or just thin slivers of butter. Sprinkle with parsley. 1. 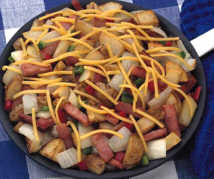 In a large, deep skillet add 1 tbsp olive oil and a pound of meat, cubed or ground. Brown the meat over med-hi heat. 2. Add equal parts of pasta sauce, water and bite-sized pasta. (A cup per person should do.) Cover, bring to a boil and simmer for 20 minutes. 3. Add sliced mushrooms, onion, pepper and broccoli, and cook under cover for 5 min. more. 4. Stir in one cup of grated mozzarella cheese, let stand for a few minutes. Sprinkle with parmesan and serve. Serves 4. Substitutions include any kind of bite-sized pasta. Chicken strips or diced ham can also be used for meat dishes, or tofu for meatless. Corn, peas, olives or sliced peppers can also be used for vegetables.